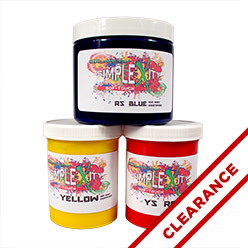 From the maker of our awesome Pigment dyes comes a new line of screen inks, SimpleXity! SimpleXity is a water based, artist grade screen printing ink intended for serigraphy. These inks have a long screen open time and are perfect for use on fabric as well as water color papers to create beautiful prints. On textiles it will need light heat setting with a household iron to achieve the best wash fastness. SimpleXity is a water based, artist grade screen printing ink intended for serigraphy. The colors are inter-mixable and can be thinned with water. They have a long screen open time and are perfect for use on fabric as well as water color papers to create beautiful prints. On textiles your design will need light heat setting with a household iron to achieve the best wash fastness. Allow the ink to air dry completely. Set iron to the appropriate fabric setting. Iron for 3-5 mins. Heat setting can also be done by tossing the garment in the dryer on high heat for 15-20 minutes. Again, allow enough time for the ink to air dry completely before attempting to heat set.